Home>News and Media>Connect with VTA>How'd We Do It? VTA is more than just buses and trains. As the congestion management agency for Santa Clara County, we have the responsibility to provide solutions for the smooth flow of traffic on our freeways and roadways, bike paths and pedestrian walkways. Our new look is reflective of the energy, commitment and responsibility we have to delivering mobility solutions. Over the past year, VTA did intensive research, including several comprehensive surveys and focus groups, to arrive at the colors, graphics, overall look and messaging that would better articulate our role as a mobility solution provider. The telephone survey included 800 people from throughout the County. To ensure total objectivity the survey was conducted by an outside survey company who directly contacted the survey participants. Survey participants included frequent and non-frequent VTA customers and potential customers. In addition to the public survey, nine focus groups were conducted. Five initially to gain further insight into how the public views public transportation and VTA and what motivates them to take or not take public transportation or other alternatives to solo driving. The last four focus groups evaluated 7 key messages and 6 proposed logos and color schemes. Each focus group also had frequent and non-frequent VTA customers as well as non-customers. With more than 140,000 daily trips and nearly 2 million residents in the County, a statistically relevant percentage of each were surveyed. We are transitioning to our new look over time to coincide with procurement and new construction. New buses already scheduled to be added to our fleet will arrive with the new logo and color scheme. Over the next 3 to 5 years, the rest of our fleet will get striping and decals of the new environmentally conscious logo and color scheme reflecting our intent to protect the natural resources of air and water. Look for the new color scheme and logo on our website, social media platforms, buses, trains and construction projects. 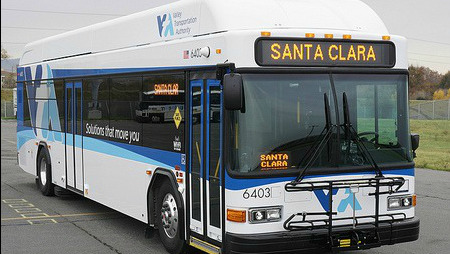 VTA is the mobility leader in Silicon Valley, providing solutions that move you.